Excursión privada a pie: Moscú, incluye el Kremlin. Mejore su experiencia turística en Moscú con una excursión privada de 6 horas a pie por los sitiors arquitectónicos e históricos más destacados de la ciudad. Acompañado por un experto guía privado, visite sitios monumentales como el Teatro Bolshoi, la antigua KGB y la catedral de San Basilio. Obtenga una visión fascinante del patrimonio histórico de la singular capital y del Kremlin en Moscú, la antigua residencia exuberante de los zares rusos. Disfrute de la flexibilidad de este recorrido privado y recibirá la atención personalizada de su guía experto. Camine desde la Plaza Roja, pase el Mausoleo de Lenin y el hotel Moscú. ¡Aprende sobre la cultura y la historia rusas con tu guía privado! Salude a su guía experto en el centro de Moscú y se embarcará en una visita a pie exploratoria por el centro de la ciudad. Maravíllese ante la vibrante Catedral de San Basilio, una colorido iglesia del siglo XVI, iglesia ortodoxa rusa, y después haga un paseo por delante del magnífico mausoleo de Lenin y el gran Museo Histórico. Admire la arquitectura neoclásica en todo su esplendor del Teatro Bolshoi, donde se encuentran las famosas instituciones culturales del Teatro Bolshoi de ópera y ballet, después vea un fascinante cambio de la guardia en el exterior de la Tumba del Soldado Desconocido. Vea además el opulento Hotel Moscú y el antiguo cuartel de la KGB. 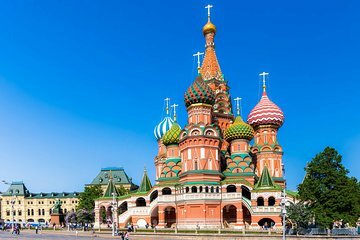 Pasee en adelante hasta el mundialmente famoso Kremlin de Moscú y comenzará una visita guiada en la ostentosa fortaleza, anteriormente habitada por los extravagante zares rusos y los líderes comunistas. Observe las vidrieras de la Catedral de la Asunción y admire las impresionantes cámaras de los emperadores rusos. A continuación se dirigirá a la Catedral de Cristo Salvador, la iglesia más grande de Rusia y escuchará las fascinantes leyendas que rodean la estructura. Finalice su recorrido con un relajado paseo por la calle Arbat, hogar de las tentadoras boutiques que venden las emblemáticas muñecas rusas matryoshka. Al final de su visita, despídase de su guía privado, se despedirá después de regresar a su hotel en Moscú. As a solo female traveller, I opted for this private tour to help orientate myself on the first day in Moscow. Was so glad I did ! It gave me confidence to navigate the metro system alone and to get my bearings with a local who could give advice. It was great to get a feel for places and areas that I could return to afterwards but even if you did only one trip whilst in Moscow this would ensure you saw all the highlights. Perfect ! Guide was very good and personable. Level of knowledge/detail was about what I expected and all that I required. This was the most sub optimal tour I have taken in a Long time. Anna the guide was hardly qualified to lead a private tour. She had charm but little in the form of knowledge of the history, culture and art of the place of which there was plenty on display. I could have done miles better on a self guided tour. Not value for money at all. In contrast read my review of the St Petesburg walk. Great English speaking tour guide who added insight into the daily life of Moscow residents. Did this tour the following day after arriving in Moscow. The tour guide was very informative and spoke very good English. Did not have to wait in any lines for tickets to the Kremlin, HIghly recommend this tour. This is a very close second to the best city tour I have had and I am strictly speaking from the experience enhanced by the guide and not the city itself. Our guide, a part time IT consultant paced the journey perfectly, encouraged interaction and complicated questions and a 6 hour walk one one of the hottest day in Moscow passed us by. The choice of restaurant for lunch was amazing as well. A strong recommendation as just a separate Moscow tour just would not do without including the Kremlin. The guide company forgot to turn up. After waiting half an hour at our hotel we rang and they lost our booking and forgot to turn up. We were offerred a tour much later that day or the following day but that didnt suit. This was the highlight of our recent tour to Russia and all because of our amazing guide - Liudmila. It was just my husband and I on the tour and we were therefore able to decide where we want to go and Mila went out of her way to make it special - not only in what she showed us, but also in what she shared with us - and her English is amazing! It was a long day, but we saw everything we wanted and more and had a really interesting lunch at a typical Russian restaurant - loved it. If you are going on this tour ask for Liudmila to be your guide - of all the guides we had in Russia, she really stood out as the best! This is one tour you cannot miss when visiting Moscow. The private walking tour of Moscow was wonderful. Antonia and Airat were very friendly and informative. They made our trip to Moscow a memory we will always cherish.